12 of the best-selling, most-used tools in 1 set. 2 v-tools and 10 gouges of various widths and sweeps. Great set for all types of carving: signs, relief, decorative, sculpting .... you name it! Mallet tools, 10" in length used in two-handed carving style and/or pounded with a mallet. 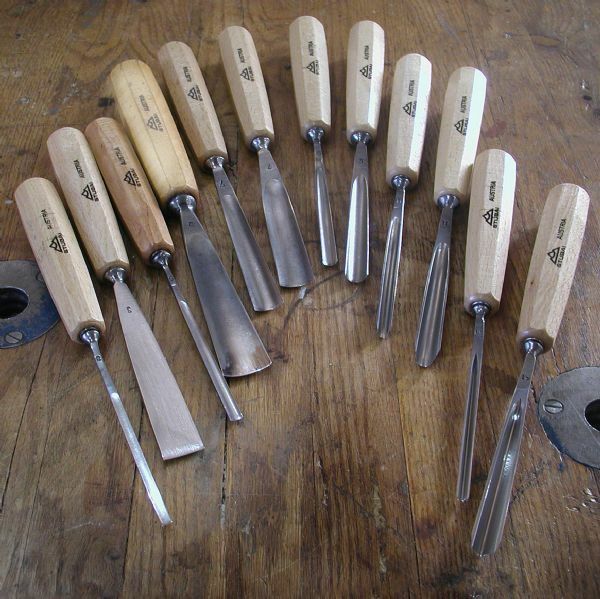 Stubai tools are hand-forged in Fulpmes, Austria ..... hand-sharpened ... top of the line. Great set for any style of carving: relief, sculpting, sign carving, decorative .... Let's carve something fun: rocking horse for the kids, fireplace mantle, carved front door, relief carving gifts for family and friends, start a sign shop ... the possibilities are endless!